Armen Avanessian and Bjorn Quiring. This essay was originally a talk entitled Knowing Horror at the symposium Real Horror, October 31st, 2010, The Windmill, London curated by Tom Trevatt and Caryn Coleman, transcribed for the online project Ingocnitum Hactenus and accessible here on-line. 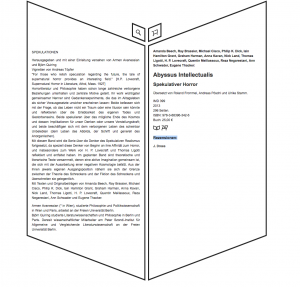 A new version was later published in Abyssus Intellectualis: Spekulativer Horror, Merve Verlag, eds. Armen Avanessian and Bjorn Quiring, 2013. The pdf essay available here is a longer form version from this last iteration. Considering a comprehension of horror as a form of aesthetic thought, a perennial problem that both the horror film and horror philosophy faces is how to think the real without putting to work some standard correlate at its base. We can see the problem exemplified in the standard structure of horror that is made up of re-enacting a methodological traversal from the known to unknown, organic to the technological, meat to flesh, human to alien, subject to object: In other words, horror is our encountering in-diverse tales of threat to ‘the known’. The popular success of these narratives in film has meant that horror has undergone modifications within the genre, rather than any radical shift in redefining the standards that is goes to work with…Horror, as the aesthetic experience that would in avant-gardist fashion lead the antagonism and circumvention of our own beliefs, our institutions and our ground, seems to have written itself out through its own institutionalization.